Lindsay Lohan has, of course, weighed in, E! reports. "WHY is everyone in SUCH a panic about hurricane (i'm calling it Sally)..?" she tweeted. "Stop projecting negativity! Think positive and pray for peace." She later started calling it “Hurricane Sassy.” Perhaps she’s not aware it’s already not-so-hilariously killed 65 people. Other celebrities weighed in on Twitter too, but kept things less offensive. Snooki responded “Lol u wish” to someone who tweeted that the storm had “made a turn for the South Jersey Shore heading directly for @snooki." Howard Stern—who's had a number of guests cancel on him due to the storm—may in turn cancel his scheduled appearance on Jimmy Kimmel’s show tomorrow, Examiner.com reports. “I love” Kimmel, Stern said, but “I don’t really want to die to go to Jimmy’s show.” Even so, reps for Kimmel’s show, which is taping in Brooklyn this week, tell Entertainment Weekly they are proceeding as scheduled. MTV notes the scads of concerts that have been canceled due to Sandy, including Rita Ora and John Legend. The AP reports that all Broadway shows were canceled last night and today. Sandy hit the tech world, too: Google canceled an Android event that was planned in New York City today, eWeek reports. The highly anticipated event was rumored to include a new smartphone or tablet. I think that the 'classy' referred to his handling of paying audience folks because of the storm. 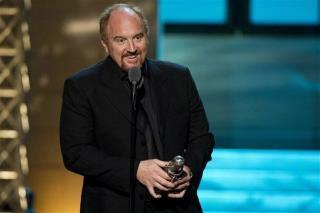 There is nothing "classy" about potty-mouthed Louis CK, the macabre spawn of Andrew Sullivan & Elton John.